Far to the right side of the decimal point—beyond milli, micro, nano, pico, and femto—lives the atto, the metric prefix representing 10-18. Slap it in front of a unit of concentration, such as molar, and it means that something exists in an extraordinarily small amount—think one part per quintillion. That’s the realm of SHERLOCK, a new diagnostic system that can detect attomolar levels of viruses in a sample and also distinguish Zika from its close relative, dengue. This exquisitely sensitive and specific tool promises to help detect diseases that other diagnostics miss, and it’s simple and cheap to use. Sexier still, it exploits a variation of CRISPR, the genome-editing method that has become the rage in biology. Scientists recognized as early as 2010 that they might be able to transform CRISPR into a virus detection device. But earlier efforts at making a viral detector became overshadowed by CRISPR’s wild success at editing genomes. 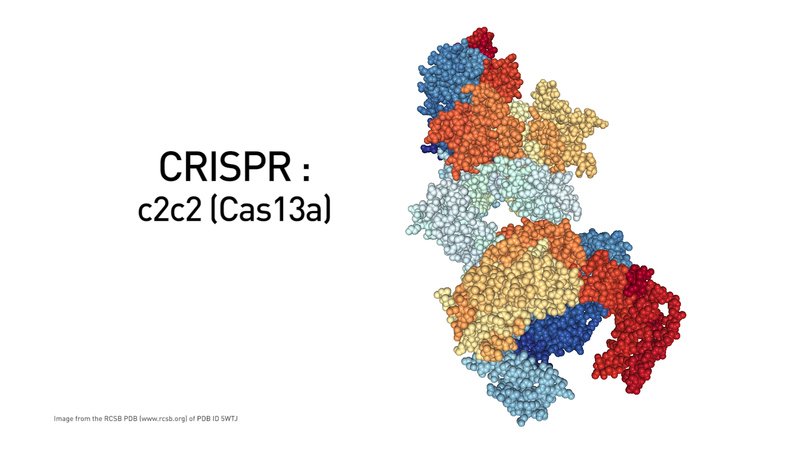 In those CRISPR applications, scientists fashion a short strip of RNA that guides a DNA-cutting enzyme called Cas9 to precise locations anywhere in a genome. The CRISPR-Cas9 scissors can cripple genes or make way for labs to add new DNA at the point of the cut, which has launched a billion-dollar industry searching for new medicines and improved crops—and sparked serious ethical debates about the potential to enhance humans. To exploit SHERLOCK for detecting small amounts of virus, the researchers spiked samples containing Zika or dengue virus with so-called fluorescent reporter RNA. When this RNA is cut, it effectively shoots off fluorescent flares. The team then unleashed Cas13a connected to a bit of RNA that targeted genetic sequences from either Zika or dengue. Once Cas13a found and sliced even a few viral sequences, it subsequently snipped the fluorescent reporters and created a detectable signal indicating the presence of the virus, the team reports today in Science . The researchers jiggered the system to also make it work on DNA targets—including cancer mutations in human genomes—by using enzymes that convert them to RNA. “It works great for both types of nucleic acid,” says Broad bioengineer and first author Jonathan Gootenberg, stressing that the real advantage of Cas13a is that it has the collateral activity and can trigger the fluorescent reporter. “There are exciting opportunities to use such systems for diagnostics in the future,” says Jennifer Doudna, a structural biologist at the University of California (UC), Berkeley, who helped lead a team that first showed in 2012 how CRISPR-Cas9 could edit DNA. (UC is in a pitched patent battle with the Broad over those initial discoveries.) In 2011, Doudna co-founded a company to focus on creating diagnostics with CRISPR—it was awarded a patentfor this—but it now mainly pursues genome engineering. A study Doudna co-authored that appeared last year in Nature described how Cas13 could be used as a sensitive detection system with a fluorescent RNA reporter, but it did not go into the detail of the new work. “It’s gratifying to see that this new paper builds on our core idea of using [Cas13] to detect transcripts, and that our results were so helpful to their engineering efforts,” she says. The detection sensitivity of the new CRISPR-Cas13a system for specific genetic material is 1 million times better than the most commonly used diagnostic technique, which detects proteins and is known in shorthand as ELISA. It’s also 1000 times more sensitive than a CRISPR-based Zika virus diagnostic the Collins lab described last year in a Cell paper. SHERLOCK not only makes it easier to find infections or cancer mutations that less sensitive diagnostics can miss, says Collins, but the remarkable attomolar detection ability means the test works far more quickly, too. A SHERLOCK diagnostic that puts the needed chemicals on a piece of glass fiber paper can be quickly designed for most any RNA or DNA target, made rugged enough for field use, and could cost as little as 61 cents per test, say the study’s authors. This could greatly help during outbreaks of new infectious diseases, which often occur in poor countries and are difficult to accurately diagnose. Collins says the Broad is now “aggressively exploring” how to commercialize SHERLOCK and may launch a startup company. But before a diagnostic comes to market, it must pass muster at regulatory agencies such as the U.S. Food and Drug Administration.